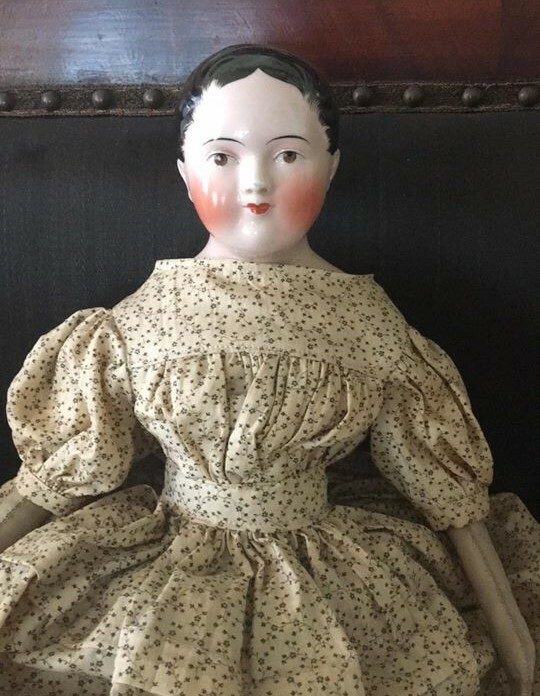 She is unmarked but I am sure she was made in Germany and will speculate she is a Kestner. I have seen one other doll who looks strikingly similar to her and was also a brown-eyed Kestner. And even though I have referred to this lovely lady as a she, because her new body and dress says she is, I believe, she was a boy in her first incarnation. Her hair suggests she was originally a boy doll. She would have made a striking gentleman. You can see her if you visit the Drake House. When I left her she was sitting on the sofa in the parlor visiting with her other doll friends. But there are more than just dolls at the Drake House. The house is opens on Sundays from 2 p.m.- 4 p.m. Tell Nancy I sent you.